At long last, here it is… Fred’s birth story! I honestly don’t know exactly when this birth story begins, because it seemed like I was potentially in labour for weeks with all the Braxton-Hicks contractions I was having. The due date was for roughly 30th July, but from very early that month I was having contractions, sometimes regular and uncomfortable enough that I was sure ‘it’ must be happening, but then… nothing. But it was a good thing labour didn’t kick off early because first our doctor was away on holiday in mid-July, and then our doula was away for a number of days for a work thing the last week of July, so it was best that the baby stayed put until our ‘birth team’ was all back in Istanbul! Anyway, I suppose Saturday, 3 August, is a reasonable place to start. I’d been having particularly strong contractions for the previous few days, and had a doctor’s appointment that day. I was sure she was going to tell me I was a few centimetres dilated and was going to go into labour any second! However, I was only 1 cm dilated and it seemed that nothing much was happening. I was a bit deflated. She told me to just relax and that maybe I was just a bit too anxious about when the baby would come, which was true. Not in a fearful way, but in a ‘hurry up!’ kind of way, I was anxious. I felt ready to get things underway, ready for the whole labour experience, and feeling all the contractions every day, I was thinking to myself, ‘is it happening now?! what about now? okay, what about NOW! ?’ and yet, another day would pass and still no baby! The doctor also gave me some special herbal tea that is meant to help get labour started and told me that usually it has an effect in a few days at most. I also mentioned that I was a bit anxious about waiting because three out of our four babysitters would have left Istanbul for holidays by the coming Wednesday (the 7th), and I was worried what we’d do and how things would work out with just one friend left available to babysit. We briefly discussed the option of me having labour induced after the weekend if nothing happened in the meantime, and I said I’d discuss it with Richie. So me, my little bag of magical midwife tea and my disappointment went home and I rang our doula Saylan to give her the update. That afternoon Şaylan came over to try some natural ways to help labour start and we discussed the idea of having labour induced at the hospital, and then decided it was better to just relax and let the baby decide when to come to avoid the possible problems of artificially inducing labour. A big thing for me was just dealing with my anxiety about the timing of things with babysitters and what exactly was going to happen if most of our babysitters were out of Istanbul when labour started. We discussed the option of Richie staying home with Liam if we had no other option and no one was available to babysit. Şaylan would be with me at the hospital, so it wouldn’t be like I’d be alone if Richie had to be with Liam. At first I was a bit sad about the idea of Richie not being in the hospital with me for the whole experience, but at the same time, I felt better just accepting that possibility and knowing that everything would work out fine, and even if Richie wasn’t at the hospital for the birth, we’d have the rest of forever to all be together as a family and it wouldn’t be the end of the world. After discussing all this, Şaylan did some massage, acupressure and aromatherapy stuff and, whether or not it actually had any effect on when labour started, it completely relaxed me and helped me really change my perspective on things. I started thinking of a line from a song by the Books- ‘you’re something that the whole world is doing’- which for me meant that I am just one person going through this experience that so many others have gone through, are going through, or will be going through. This moment in time is important for us and our small circle of family and friends, but in the grand scheme of things, me, my baby, whether I went into labour today, tomorrow, a few days from now… it somehow felt insignificant, but in a comforting and liberating way. I just felt relaxed and a part of the whole amazing living process, and knew that things would take care of themselves and the baby would come whenever he was ready. Fast forward to Tuesday morning… Richie, Liam and I had a lovely breakfast in Besiktaş with our friend Marijke. After parting ways with Marijke, the three of us headed for home and Liam’s nap. On the walk back to our apartment, I got a text from the doctor asking me to come in that afternoon for a regular check-up. So, after a sweaty walk up our hill, a cold shower and a very brief rest, I headed out for the Asian side of the city to her office. As we talked, she said she could tell that I was more relaxed this time, and I told her I had decided to just let things be and not worry so much. When she examined me, I was 2 cm dilated and she said she thought things would begin sometime in the next 24 hours, but also reminded me not to think too much about it! I took the ferry back to Besiktaş , and walked part of the way home because I needed to get some chicken for our dinner that night. I was feeling contractions all during the walk home and a cramp-type feeling that was pretty uncomfortable. I’d been having so many contractions FOREVER that I didn’t want to think too much about it, but these contractions felt a bit different and reminded me a bit of the feeling I had just before going into labour with Liam. I took a taxi up our hill and then hung out with Liam a bit, and as I was growing increasingly uncomfortable, Richie volunteered to make dinner while I gave him instructions. Contractions were continuing, and they were strong enough that I had to stop what I was doing while they were happening, but in between I felt pretty normal. I was getting a bit suspicious that this was the real thing, but still didn’t want to get my hopes up. We sat down to dinner, Richie gave Liam his evening bath and put him to bed and I took a long shower. We decided to ring Amanda, our last remaining babysitter, and Şaylan, to warn them both that I might actually be in labour. We both pottered around the flat a bit, making sure everything was packed, organizing Liam’s food for the next day and instructions, tidying the kitchen, getting all the last-minute stuff ready. Then Richie and I rang our parents to tell them things were starting and then rang Amanda to ask her to come over. Richie and I left the flat at about 11:30pm to go to Şaylan’s apartment, which was on the Asian side of the city, not far from the hospital. I tried to stay comfortable in the back seat, reaching around the front seat to hold onto Richie and squeeze his arm during contractions. I actually enjoyed the drive over the bridge across the Bosphorus and the amazing night-time view of Istanbul, which was a bit unusual because I have quite a fear of bridges! Şaylan’s apartment was so lovely and relaxing. We all chatted a bit and ate some cookies. Then I took a shower, Richie decided to get some sleep in the guest room to save up his energy for later on, and then I rested on the couch, sleeping in between contractions while Şaylan massaged my back. Şaylan talked to Dr Gülnihal to tell her how things were going, and then timed my contractions for a while so she could report back to the doctor. They were feeling pretty strong by now, were about 1 minute long and 5 minutes apart. The doctor then wanted me to go to the hospital to check how dilated I was and to have an NST test. We were going to head back to Şaylan’s if things hadn’t progressed very far. Basically, as soon as I stood up to head out the door to the hospital, the contractions felt like they were right on top of each other. I had about five just getting off the couch and going to the bathroom and putting my sandals on! We took a short taxi ride to the hospital and the taxi driver was very considerate and drove slowly so the journey wouldn’t be too bumpy and uncomfortable. Şaylan and I walked into the hospital and headed for the maternity floor and I was seriously having almost constant contractions. I was still able to make some jokes in between at this point. I remember saying something about how I was ‘running’ down the hall (in reference to how nurses always seem in a hurry and when you’re having constant contractions, hurrying isn’t really an option and I was actually walking at a snails pace and stopping every few steps to have more contraction!) Well, I had my examination, which I hated, my water broke, and I was 6 cm dilated. I had a big sobbing cry at this point, due to the discomfort of the examination, the intensity of everything, and I’m sure a few wily hormones contributed as well, but I recovered! So, Şaylan called Richie to tell him he better head over to the hospital and bring our stuff, and then she rang Dr Gülnihal to let her know our status. Really, it gets a bit hazy for me at this point, because obviously things got pretty intense and also because everything happened so freaking fast! Richie says that by the time he got to the hospital, at about 3:45am, it was only about an hour and fifteen minutes until the baby was born! After my examination, I had to lay down for an NST test. I absolutely hated laying on my back when I was pregnant and I REALLY HATED IT when I was in labour! I honestly don’t know how so many women have gone through labour in this position. I think I would absolutely have died! Then, back in our labouring room, Şaylan helped me take a warm shower, which was so refreshing and relaxing. Richie arrived at this point and went to fill out some paperwork. I put on an ugly hospital gown and I think at this point I settled into position kneeling on the floor while resting my upper body on the couch in our room. Şaylan told me at some point that Dr Gülnihal had arrived although I don’t think I responded and only a small portion of my brain registered the information. Dr Gülnihal examined me again and told me that the baby would be coming soon, although I decided not to think too much about that because I didn’t know if that meant in 15 minutes or an hour or 2 hours, etc. After a little while I got a bit of the urge to push and the doctor decided it was time for us to move to the delivery room. I absolutely could not get up though. I was kneeling on all fours and contractions felt almost constant, so moving from that relatively comfortable position to standing up was more than I was physically able for. I think Şaylan actually asked Dr. Gülnihal if it was possible to jut stay there, but the answer was a definite ‘no’, so we had to go. I gave it a shot but just could not get myself up off the floor, so eventually, Şaylan and Richie each took me under the arms and hoisted me up and into a wheelchair to get me to the delivery room. A birthing stool was set up for me and, again with a bit of help, I settled in, leaning back on Richie who was sitting behind me for support. I won’t lie; it was painful and intense, but it was also fast! There was lots of squeezing of Şaylan and Richie’s hands, there was definitely some roaring and cursing, and out came little Fred! I was so much more aware of everything during this phase of Fred’s birth, whereas with Liam, I was so out of it by that point, I barely knew he was out until Richie told me and they put him on my chest! I must have been pushing for less than an hour with Fred and because of my position, I could actually see him right away. The doctor put him right on my chest and Şaylan tried to help me get him to nurse right away, but he was too busy shouting to latch on. 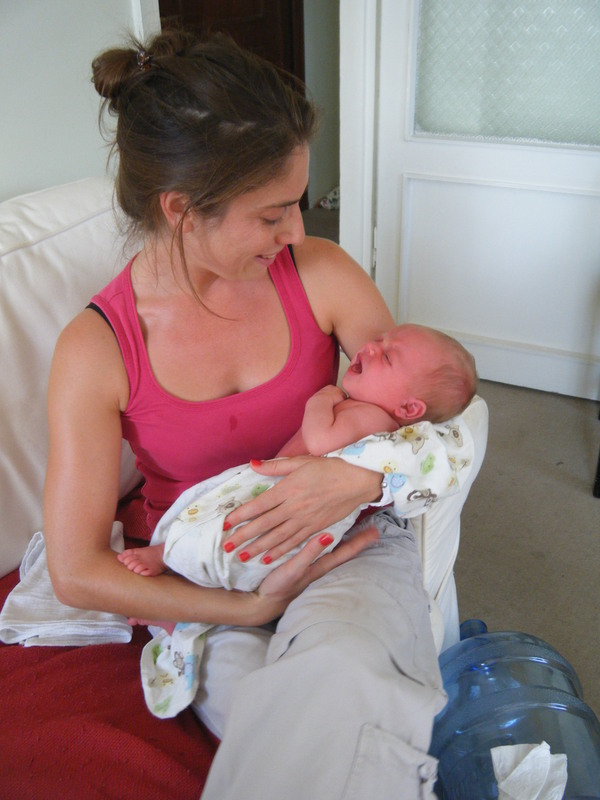 But it was amazing to hold him right away, all noisy and tiny and wiggly. I really couldn’t believe the entire labour and delivery was already over and he was there in my arms! It was just so so different from my first experience. I think this labour felt harder in a way because it was so much faster near the end, and it was just so intense. And maybe because I actually had energy and wasn’t so exhausted and out of it, I really felt everything more, was aware of what I was experiencing, and will remember it all a bit clearer. I am really happy about the preparation we did before the birth, such as practising the massage techniques, and I had a much better idea this time of things to try to cope with contractions – different positions and movements, etc. It was also fantastic not to be at the hospital so long, because I think being at home and then at Şaylan’s helped me stay much more relaxed so that things could flow along at their own pace without all the annoying poking and prodding and interrupting that seems to go on the entire time you’re at the hospital. I’m happy I ate a real meal early in labour, that I got extra rest/sleep at Şaylan’s before we headed to the hospital, and that I took those few showers to help me stay relaxed and refreshed. I’m thrilled I had the same great doctor and such a fantastic doula, and extra especially, my amazing husband there to support me so much before the birth and, of course, at the birth! 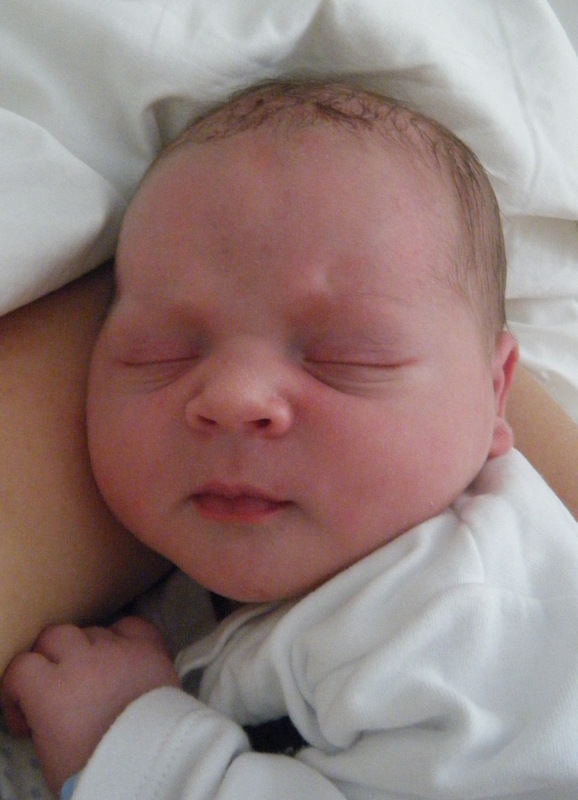 And last, but not least, I’m so glad we got to welcome our strong, healthy, wonderful little Frederick into the world! I have been trying to think of a way to show my appreciation for our amazing doula Şaylan, but it’s been hard to think of an appropriate gift or whatnot. So, I decided to at least share with the world how great she is, at least as a start! Richie and I both think she went way beyond the call of duty throughout her time as our doula, and she certainly did much more than I would have expected a doula to do. We met with her every month for most of the pregnancy and she was very accommodating and came to our apartment because it was much easier for me with Liam, especially as I got bigger and the weather got hotter. Just a few days before I went into labour she came to our apartment again to try some massage and acupressure stuff to get my labour started naturally, and apart from that, she just helped me relax completely at a stage where I was feeling very impatient for the baby to come and was a bit discouraged that nothing was happening yet. And perhaps most importantly, she suggested that we go to her apartment during early labour, since she lives very close to the hospital we chose to have the baby in. I think this was one of the best parts about this labour experience. We stayed in our own home longer as we got last minute things ready for Liam, and then went to her apartment on the Asian side of the city. At her place Richie got to get some extra sleep, I had a shower and got some rest while Şaylan massaged my back through contractions and helped me stay relaxed. When it was time to go to the hospital, she handled everything, taxi journey, talking to the doctor, dealing with people at the hospital, which again allowed me to stay relaxed and just focus on contractions and what I needed to do. I think we were only at the hospital for a couple of hours before the baby was born, and I’m so glad it worked out this way! Being in a comfortable home environment made everything go so much smoother and I felt so much better and more energized when the final stages of labour came. Şaylan also did an amazing job of ‘protecting’ me from the hospital staff too. Nothing against the nurses, but for them it’s all just another delivery and there was a general feeling that they wanted to rush me along at various points; get to this room, do this just a bit faster, move over here a bit quicker… I didn’t care too much anyway, but it was great to have Şaylan on my side, making them let me go at my own pace for all these things. She was an excellent support throughout the entire labour and delivery and stayed for hours and hours after Fred was born, helping us by translating what nurses and other hospital staff had to tell us about various things and just keeping us company in those sleepy hours. Eventually, she went home just long enough to freshen up a bit and then helped us leave the hospital as well. When she came back from her short break, she also brought lovely little cakes, which was especially welcome because I’d been virtually sugar-free for much of my pregnancy and was absolutely dying to eat some delicious sweet treats! It was just the ‘icing on the cake’, if you’ll excuse the pun! Overall, she just made it feel like we’d been friends for ages, and she just enjoyed being there with us all along the way. She certainly didn’t make it feel like it was just her job. 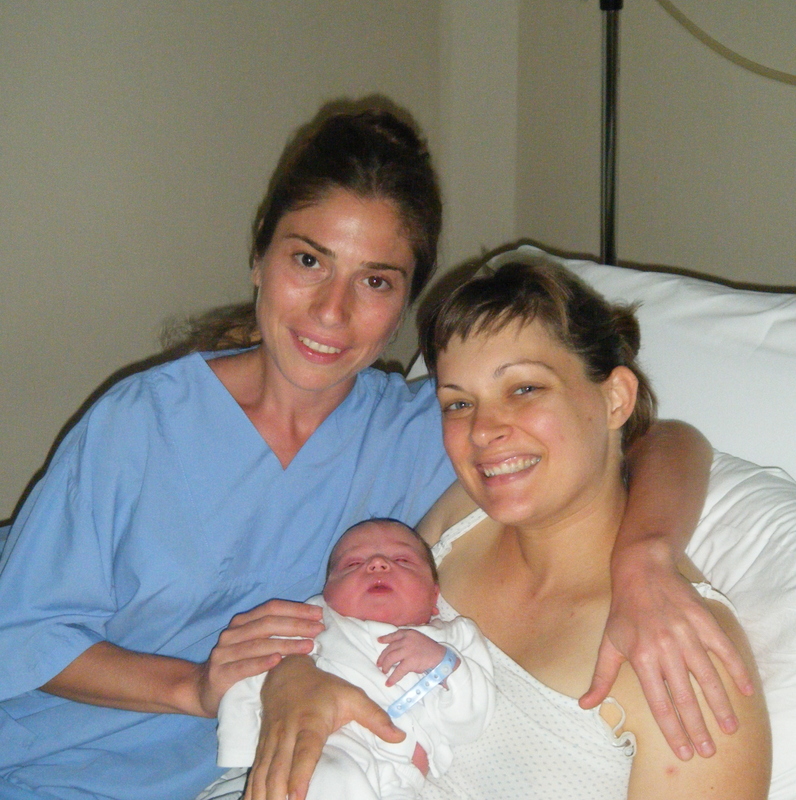 I am truly impressed and touched by how involved and caring and generous she has been, and having her with us really helped make this birth experience wonderful. She is an absolutely fantastic doula and anyone would be lucky to have her there to support them in pregnancy and birth. So, Şaylan, thanks so much for everything you did! We will always have great memories of all your involvement in Fred’s birth. It certainly wouldn’t have been the same without you! Well, I had my regularly scheduled doctor’s appointment yesterday and it was both fun and very motivating. It was great to see the images of the baby with the ultrasound. Now he looks so ‘baby-like’! Got a great glimpse of his face and everything is fine and wonderful with him, so that’s obviously the best part. Also, all of my carb-avoidance and healthy eating has been paying off! The doctor seemed quite pleased too when she told me I’d gained a kilo and a half since my last visit, which she said was exactly the amount I should have gained just due to the necessary baby-weight, etc. I was so happy! It hasn’t been the worst thing ever trying to cut out the carbs and really watch what I’m eating, but it hasn’t been the easiest thing either and I certainly do have those moments (or days!) where I just really want to EAT WHATEVER I WANT and not care about the sugar or whatnot. But hearing that my efforts are paying off, and hearing the doctor tell me if I keep up like this the baby will stay the ‘right’ size and I should have an easier and quicker labour and delivery, it’s just really great motivation to keep going like this for the next two months. It’s nice too because I have had the odd treat, a bit of something sweet here and there, so it’s good to know that having those treats won’t put me over the edge, so to speak. I was also afraid before the visit that I was going to be told my blood pressure was too high, like when I was pregnant with Liam. While avoiding carbs, I have indulged in plenty of cheese and olives and other tasty, salted things. I have to have some flavour! I was just dreading her telling me my blood pressure was high again and I’d have to cut out the salt, and then the eating thing really would have been difficult. However, my blood pressure is normal, so for now anyway, I can still have my salty cheeses and olives and that sort of thing without worrying. Thank goodness! So, I’m now just about 32 weeks along and my rough due date is July 30th, although she said we could expect the baby to come any time after July 21st. I’m glad we still have a good few weeks to finish preparing for his arrival, but I’m definitely getting more and more excited and impatient to meet him! It’s still hard to believe it’ll be such a short time until we have TWO little boys. What a happy thought. Oh, and as an aside note, I really want to find a nice ‘baby’s first year’ sort of book for the new little guy. I’ve looked at a few on Amazon.com but it’s hard to pick things out like that without taking a proper look at them. I got this lovely book for Liam from my mother-in-law, and liked it so much I gave one to my sister as a gift for her soon-to-be-arriving baby. Anyway, if any of you mama’s that I know have one that you like, especially one that can be easily found on Amazon or whatever, I’d love to know about it. Thanks! I think this is going to be a ‘random thoughts’ post, just to put that warning out ahead of time. Beware of unexpected nonsense and half-baked ideas! First of all, I’ve been having ‘American things’ cravings. I want to go to a baseball game. I want to have a barbeque and eat hamburgers and bratwurst and potato salad and CORN ON THE COB slathered in copious amounts of butter. I want to go camping or at least hiking in a foresty national park. I want to sit in a grassy back yard and possibly play in a sprinkler. I want to go to the beach. You get the idea. I think because it’s summer now, BUT we’re staying home so much and not really doing our normal Istanbul summer stuff, as a replacement I am really missing all the summer associations of home. It’s funky and I don’t really know what to do about it. This is just going to be a summer of not much being out and about, which I’m okay with, but it’ll feel sort of weird to be missing out on the usual going to cafes and sitting outside drinking tea for hours and all that kind of thing. And, lets be honest, probably most of it comes down to food and I just really want yummy summer food. And a nice cold beer sounds pretty great too. I think I’ve also started getting to that impatient phase of pregnancy. I have two months to go, which sometimes feels like a long time and sometimes feels like no time at all! We’re doing all this home-related stuff to get ready for the baby, and hopefully soon we’ll have the new crib and things will pretty much be set up. I’m glad we still have some time before the new little guy arrives, but part of me just wants to get to the end and have him here already! I’m anxious to start this whole new chapter in our lives, but then again, I also want to be in the moment now and enjoy this relatively calm time with Richie and Liam before everything changes and gets a bit crazy for a while. Especially for Liam, I want to make the most of these next two months and just have fun with him and fill him up with lots of extra lovin’ before he has to deal with the big adjustment of sharing us with a new baby. But it’s hard to be in the moment when there’s just so much to think about and look forward to. My brain is a bit split in two. If I’d just settle down to do it, I think some yoga/meditation would be great for helping me calm down my overloaded mind and just bring me back to the present, which is really what would be best. Must try harder to do that. I’ve also been thinking a bit about the medium-term future, in relation to jobs and where we’ll live and how we’ll live, etc. I haven’t been thinking about it loads, because obviously the first priority is just to focus on this baby-having thing, but I think precisely because we’re having another baby, I can’t help but be thinking about our future and wanting to have some clearer plans or ideas about what we’ll be doing in the next couple of years or so. I’ve actually been thinking about researching some ‘work from home’ options, although to be honest, I have no idea where to start. I still have teaching as the most likely and most sensible job for me to go for, but at the same time, I don’t want to have a rigid plan that entirely depends on one single job option. If there were some sort of job I could do from home, especially if it was something I could begin while we’re in Turkey and didn’t tie me down to one location, it could be really useful as we try to transition back to Ireland (or the US). Plus, childcare is just so expensive, working from home for a few years could certainly have financial benefits. PLUS, I just hate the idea of putting my kids in day care. It’s certainly not a judgement on anyone who has to or has chosen to do so, but I just find the idea of handing my tiny kids over to some strangers in a day care to be one of the most soul crushing and depressing ideas ever. Maybe it’s because I was raised by a stay-at-home-mom, I don’t know. I may have to get over that at some point, but if it were possible, I’d love to avoid it. Anyway, work from home… perhaps something education related or maybe editing. I honestly don’t know, but it’s just something I’ve been casually thinking and wondering about. Well, I think that’s enough of me rambling about this and that. It is a bit therapeutic to put it in writing rather than just leaving it to float around aimlessly in my head! So, this is kind of a random post, but I had my first experience of passing out yesterday. At least that I know of. I had to do one of those glucose blood test things I’ve heard of so many pregnant women having to do, but somehow I got lucky and didn’t have to take one when I was pregnant with Liam. Anyway, Richie took the morning off work yesterday so I could go to the lab to have the test done. Little did I realize that it would take more than THREE HOURS! As a result, Richie’s morning off morphed into Richie’s entire day off, and he’s just going to make up an extra day of work in a week or so. I was in a happy place! Haha, it’s so weird, the experience right before passing out feels miserable, but being passed out feels kind of nice! It was like dreaming a bit, that’s all. I have no idea how long I was out, but I opened my eyes with one nurse holding my feet up and another one rubbing lemon-scented Turkish cologne on my arm and holding it under my nose and rubbing it on my forehead. Funky. I think the lemon cologne was particularly magical. Then after I recovered a bit, it was back to the waiting room to drink the most sugary lemonade ever, which made me feel a bit ill for a while. During that first hour of waiting I just had the strongest urge to lay down and fall asleep, and I must have dozed off because the nurse came to tell me not to sleep. Luckily I had my kindle with so I just read loads, and it got easier as the time passed. I didn’t faint again anyway! So, I get my results in another day or two and fingers crossed I don’t have a big blood sugar problem. I’ve been really behaving myself for the last week or so, cutting down the carbs and sticking with the protein and stuff, so I really, really hope that’s all I have to do. I guess I’ll find out. All I know is that, either way, when this baby arrives, I’m treating myself to a great big giant cake and I’m going to enjoy every single bite of it! Can’t wait!